Taste test: This was one of the more entertaining chip bags I've seen in a while. 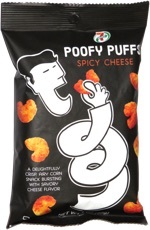 The bag design was a blatant ripoff of Baked Lay's, and there were more enthusiastic nutritional claims backed by exclamation points than I've seen in a long time. Upon opening the bag, it was clear that these were not actually potato chips, but rather crisps, with a shape similar to rice cakes. 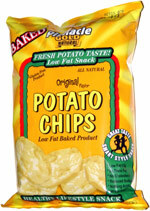 The taste seemed a bit bland at first, but there was some nice potato flavor when I took a second one. Our tasters enjoyed these a lot and quickly ate their way through the bag. Smell test: Barely any. Just the slightest potato smell.